On November 4, in the Docudays UA Cinema Club in the Space of Ideas, the screening of the documentary film “March of Dialogue” was disrupted. On Friday, at the office of NGO “Kremenchuk Informational and Educational Center “European club” so called the Space of Ideas, the screening of a film “March of dialogue” of Oksana Piddubna, a Ukrainian film director and discussion with the audience should be held. But, according to organizers of the event, before they received a call and warned that the guys from CC “Azov” are going to disrupt the even. “We are not going to show the film for the first time on LGBTIQ. We watched a Serbian film “Parade”, “Pride” and “Children-404”. Last year at a traveling festival Docudays UA there was a photo exhibition about relatives “Our family,” Olena Hloba, a spokeswoman from the Parents Initiative “TERHO” came, a living book in the Living Library was transgender person MtF. And nothing has happened”, says Alyona Hlazkova, the head of Docudays UA Cinema Club in the Space of Ideas and regional coordinator of the Travelling Film Festival in the Kremenchuk city. What high values are trying to “protect” the attackers? From whom? Whom disturb movies about human rights? “Ten minutes before the beginnings, young men came into the room. They behaved arrogantly, refused to take off overcloth, moved things and said that they will not allow watching the movie. I immediately went outside to call the police. When returned to the room, they started to shout, “guests” used obscene language and threatened to smash the office. Some threats and their actions I recorded on video”, describes the situation Svitlana Ovcharenko, co-founder of the Center “European club”. “When the police arrived, the attackers opened the face and immediately left the room. The police talked with them and said: “guests” said they came to the open event; they do nothing illegal, but simply have a different position. Referring to busyness, the police offered to apply again if necessary and left. The “guests” came back. Shouting a little and promising to visit every such event, they took the flag of the LGBT community that was in the office. 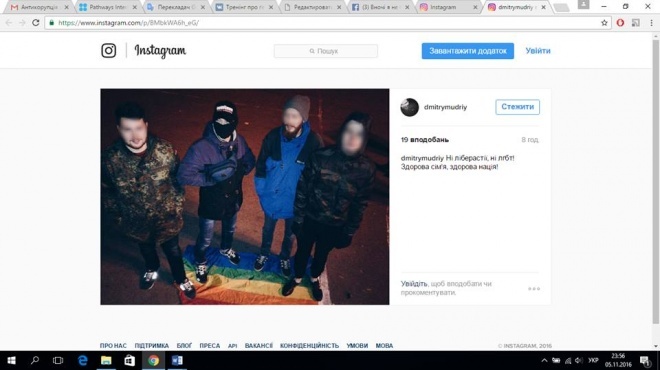 Later in social networks at one of the attackers posted the photo, where he and a few others with hidden faces stand on our flag. Under the photo is the caption: “No liberasty, nor lgbt! Healthy Family, Healthy Nation! “. Now the access to this page is blocked”, says Svitlana Ovcharenko. “We decided to prepare to the beginning of the Travelling exhibition in our club (we planned to open it with the film “Call me Marianne”) and show a film about the Parade of Dignity in Kyiv. This story showed very different reactions. We today (November 7 – Ed.) has written a statement to the police. The Police apologized, and the head of the police gave his phone number and said that we can call him day and night”, adds Alyona Hlazkova. 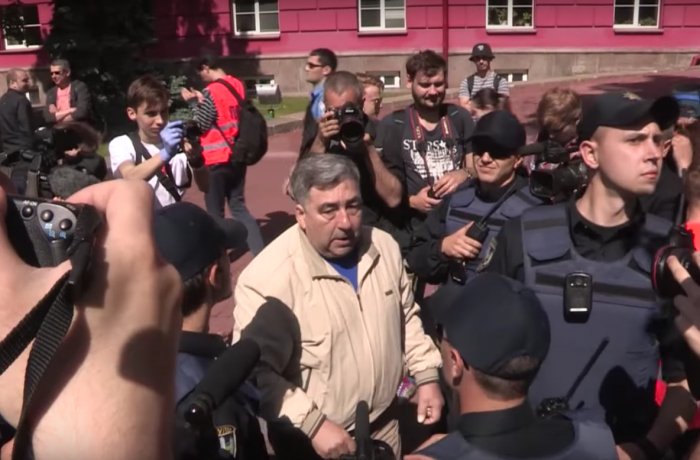 According to Volodymyr Yavorskyi, a human rights activist and member of the organizing committee Docudays UA, the following right-wing radicals are illegal and violate freedom of speech and expression. “In Ukraine, this is not the first disrupted show. However, the police do not respond to such lawlessness. I do not know any example of punishment for those responsible. This is an immediate duty of the police. It promotes such cases that are obviously negative for human rights and democracy. Overall, it shows that our society is far from democracy; some people constantly use force to force others to do something or not to do. In such circumstances, where there is intimidation, we cannot talk about freedom in the country. Since this is not the first time. It looks like the police should review their inaction at the national level “, Volodymyr Yavorskyi adds. For more information, please contact the press service Docudays UA – press@docudays.org.ua.